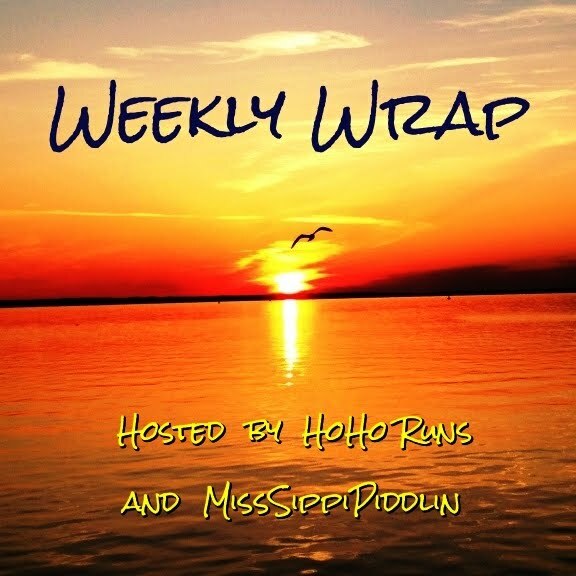 One thing I neglected to bring up during my weekly wrap was that I had a major pain in my shoulder all week. At first I thought it was from constantly typing on my phone ( as I had felt a twinge of pain earlier and thought that's what it could be from). This pain was major and by Saturday night I could barely move it and it hurt to even lay down on it. running with a pain like this. I desperately needed a massage but it was a little late for that now. Would foam rolling it work? Was it a pulled muscle? When I woke up on Sunday morning I could barely pull myself out of bed because I was in so much pain. I decided to put some Biofreeze on it and hope for the best. It wasn't until I was out in the garage watching Scott load things into the boat that I realized why my shoulder was so sore. The only picture of my ( partial) lawn I took over the weekend. 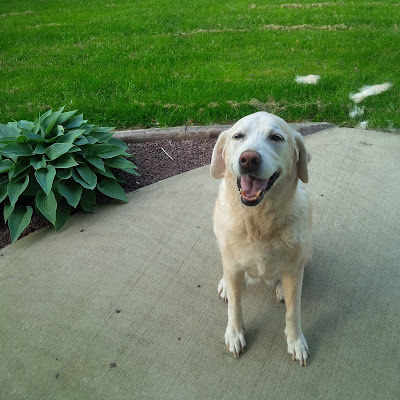 Scott had been away all week and I wanted to surprise him by mowing the lawn before he came home. The riding lawn mower intimidates me ( especially when no on is around to help me with it) so I opted to use the push mower. I thought it would be fun to see how many steps I could get in. The mower is self propelled which makes it easier to push, but it is not self starting which means that you still have to pull the string to get it going. I pulled the sucker at least 6 times before I got it going. Each time I pulled it more fierce than the last because I was getting frustrated I couldn't get it going. It finally started and that is how I do believe I injured my shoulder! How could I have not remembered that? Do you mow your lawn? Have you ever hurt yourself doing chores? Having a long weekend was the perfect way to wrap up the month of May! Since I met all my running goals during the week last week, I decided I decided to skip any runs this weekend and have a little fun around the house. This weather has me super motivated to get my home looking Summer Ready! Here are a few of the things I got into over the Holiday Weekend! I actually went shopping on Saturday! If you know me, you know I am more of an online shopper because I hate driving around to stores looking for what I want. I finally found a new swim suit I feel somewhat comfortable in and I found some bathroom rugs. I could not find pink ones like I had wanted but I got some cream ones. I;m not loving them, but they'll do for now. 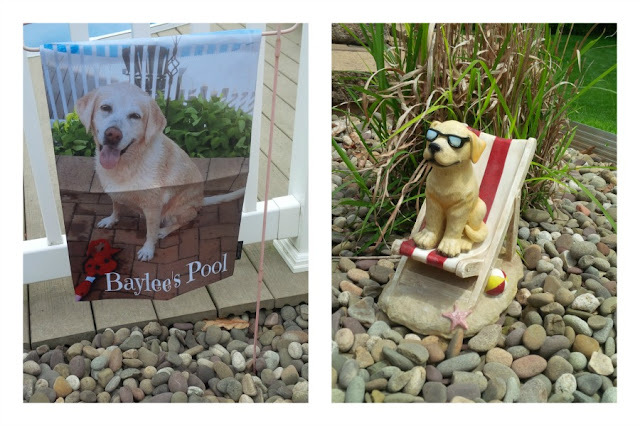 While shopping I also found this cute lab statue and knew I had to bring him home to sit out by the pool. I guess he'll be Baylee's lifeguard! I also hung Baylee's Pool flag. This is the first year for the flag and I hope the sun doesn't damage it too badly because it's something I hope to keep for a long while. After shopping I did a little DIY project. We've had this bench sitting on our porch for years. I painted it green about 10 years ago (or more) so it would match the trim on our house. 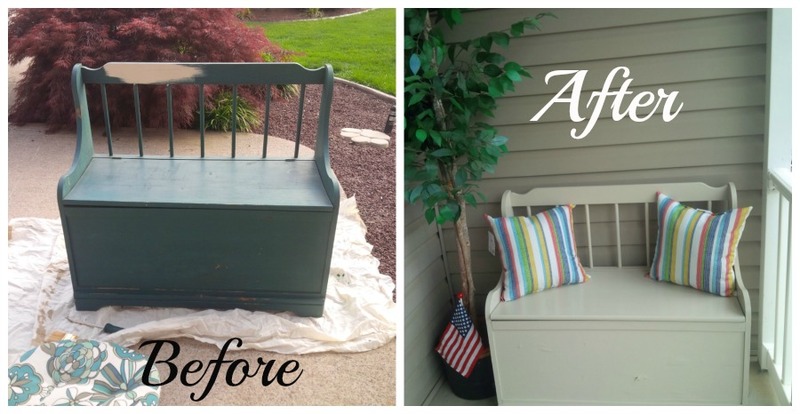 As of last summer, we no longer have green trim on our house so I thought it was time to give our little bench an update. I bought some outdoor toss pillows and put the bench in the corner of our porch. We often have visitors stop by while we are on our rocking chairs, so now they will have a comfy place to sit while we chat! On Sunday I cleaned my dressing room out again and got rid of more clothes and shoes and organized others. I've never packed away seasonal clothes but my bins were starting to over flow with pajamas so I decided to pack up the winter ones. I kept one or two pair out since Scott likes to have the air conditioning on what feels like freezing! 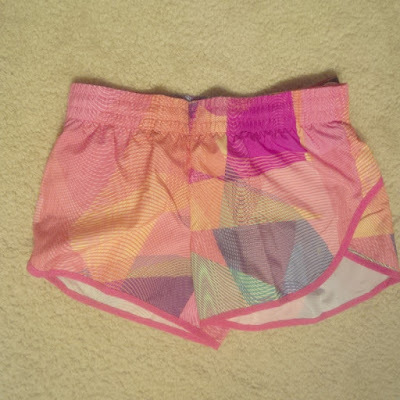 I noticed I have a lot of running gear that I never used so I think maybe I should consider putting it on ebay. My body just feels so much lighter and much more joy is added to my life when my rooms are clean and organized! Even though Monday was still part of my weekend, it technically started a new week and that meant I still had a run to do. By the time I got to the park I realized I forgot to bring my water bottle. That meant there would be no speed work happening. I decided to do 3 miles at an easy pace instead. I was feeling patriotic in my headband, red top, and blue running skirt. I thought it was going to be the humidity that slowed me down but it turned out it was a very tight calf by mile 2. I could tell I was slowing down and then my calf got so tight that it was painful. After a very short walk break, I was able to pick up the pace where I left off. After that we headed to a cookout at my parent's house because isn't that what you do on Memorial day? Did you dress patriotic this weekend? Do you pack away seasonal clothes? Do you do DIY projects? I'm very please with how this past week went. I actually made a plan and I stuck to it. Every day this week I ran. I got in 3 miles but only running hard the first mile to see what I could do since I am doing the Monumental Mile next month. I figure I should try to focus on speed. I am pleased that my pace has been in the 8's. I would be thrilled if I could pull that off on race day but if history is any indication, it will be hot, humid, and miserable and I'm sure I'll be much slower. But then again, maybe the energy of race day will pull me through and I may be surprised at my time. 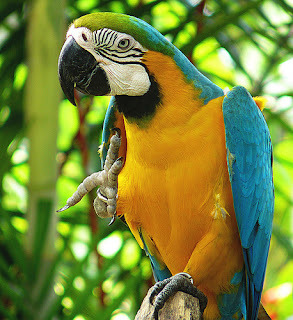 Twice this week I 've seen this guy down at the park with a tropical bird that looks like this. I wish I could have grabbed a quick picture but the first time I saw him he was coming off the trail as I was just getting out of my car. The second time he was just getting into his car as I was pulling in. Both times I saw him, the bird was sitting on his shoulder (even while he was driving). Speaking of animals, I also saw a lady that had a chipmunk in a cage. As I was getting out of my car, I watched her let it go into the woods. I just thought this was odd, as we see chipmunks all the time, Why would someone bring it to the park to release it? Okay, my Nancy Drew instincts kicked in and I just had to ask what she was doing. She said she has Chipmunks in her flower beds so she bought this trap. Every day she catches one in the trap and brings it to the park to release it. Okay, I guess the critters are damaging her flowers. That just seemed odd to me. Will she be doing this all summer? When people have gardens and rabbits get in them, they don't try to catch all the rabbits! They make adjustments to their garden, right? I saw her again doing the same thing a few days later. Okay, I guess these critters have nothing to do with running, except the fact that there is never a dull moment in my park and if you've been a loyal reader, you know that to be true! 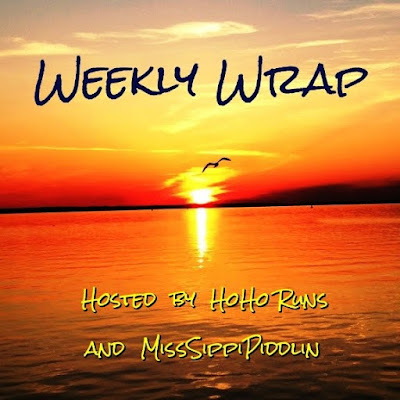 We are linking up with Holly and Tricia (and the guest hostess) for their weekly Wrap! Wow, I think we can all agree that this month has just flown by. It seems like I have been saying that about all the months this year so far. I think it's an age thing though. The older you get, the faster time seems to go by. What do you think? 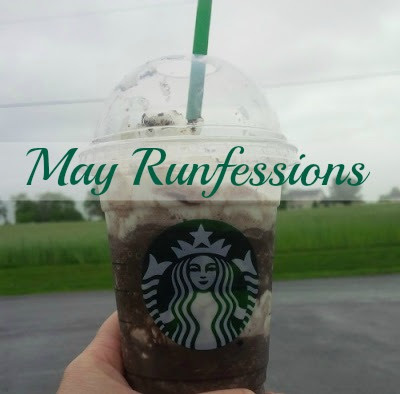 Since it's the last Friday of the month we'll be sharing some Runfessions! 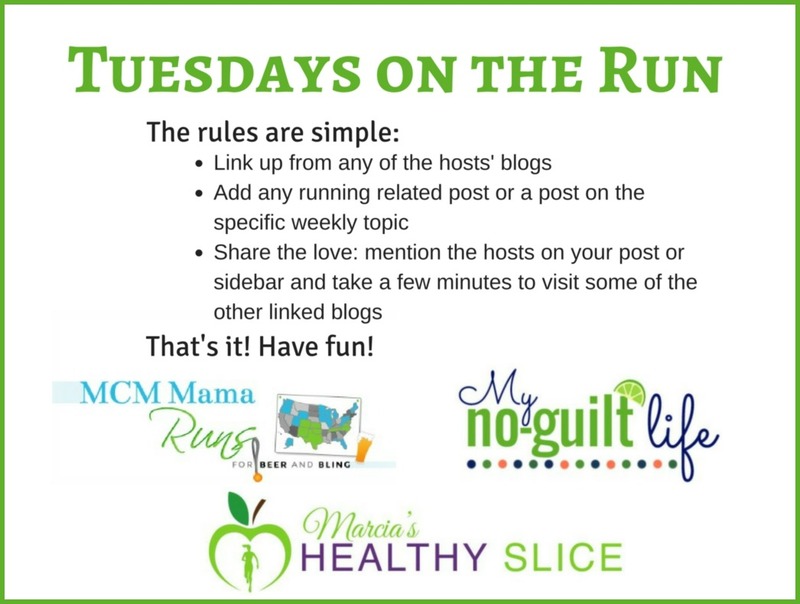 Please feel free to link up any "Five" things post about your month or your running (but please make sure it's in the "5" format! I runfess that I was a little bummed about giving up my race registration for the Pittsburgh Half Marathon this month but was pleased to know that Gretchen was able to use it instead. I really enjoyed the Frappe that Gretchen bought me as a Thank You! This was the Midnight Mint Mocha! 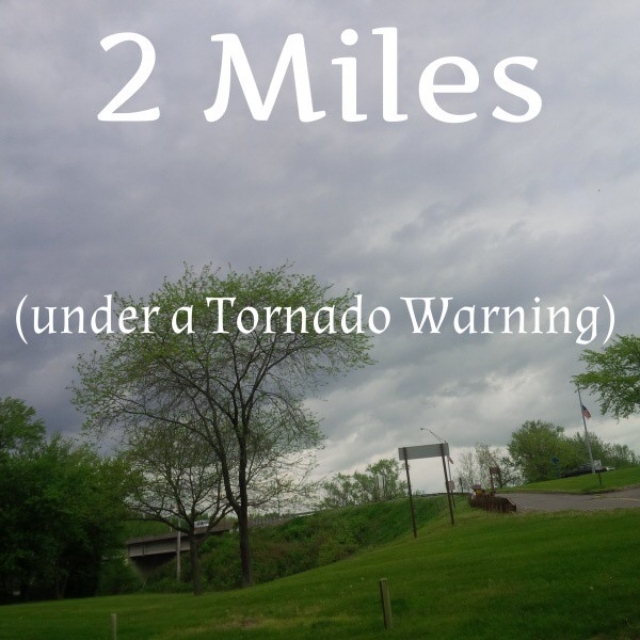 I runfess that even though I was the only one at the park and we were under a tornado warning, I ran anyway! It was kind of spooky (and refreshing) running through the woods with all the branches swaying back and forth. There were major waves white capping out in the water like I have never seen before. To be honest, I didn't realize we were under a tornado warning until I turned my ipod on to listen to the local radio station. I felt safe enough to do 2 miles though. We never did get the tornado, just a heavy storm. I runfess that I never did sign up for that Pirate theme 5k/10k that I wanted to do (it is tomorrow). I also runfess that I am in no shape to run a 5K (the way I want to run it), but my running buddy is running a local 5K race here next weekend and I kind of want to join him but he warned me there is a huge hill! 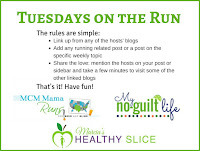 This last runfession comes from Lacey, and I know it's one she often feels guilty about! I Runfess that after my long runs I take the elevator up to my 3rd floor condo! And just like that we end the last full week of May!! I have all these cool ideas of what I would like to do with my race bibs, but for now they are just stuffed inside a scrapbook. They are not placed neatly on pages, they are literally in a pile and just shoved in there. 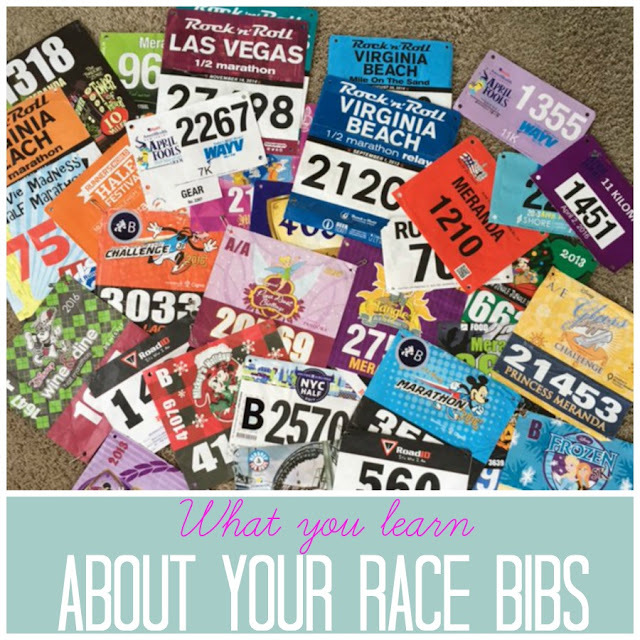 As I was adding another race bib to my collection, I took them all out and took a little stroll down memory lane seeing if I could remember which race each of them were from. You would think that was a no brainer, but really it wasn’t. As I was shuffling through them, I realized a few things. I love the bibs that are colorful or have graphics on them that represent the race. I’ve only used my “Gear Check” ticket off my bib one time. Although most bibs have a “Gear Check” ticket on them, only a few have beverage tickets and food tickets on them. I ran one race that had 4 beverage tickets on it. WOW, is THAT much post race beverage necessary? Just to note, I have never used a post race beverage ticket. I may have removed one to give to another runner though. Some bibs have the date of the race on it, some do not. In order to determine which race I did which year, I would have to look at the timing chip and look at my age. This worked in some cases. In some cases my age was wrong. 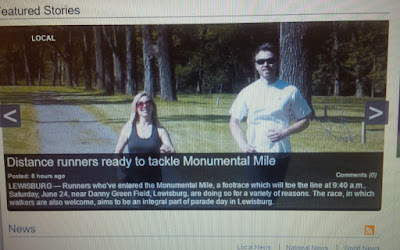 It’s a good thing I was never close to placing in those particular race. I have since put the name of the race and date (if it wasn't already on the front of the bib), and wrote my time on the back of each bib as well. The other day one of my students was wearing a shirt with an elephant on it and it said “Run Wild and Free”. 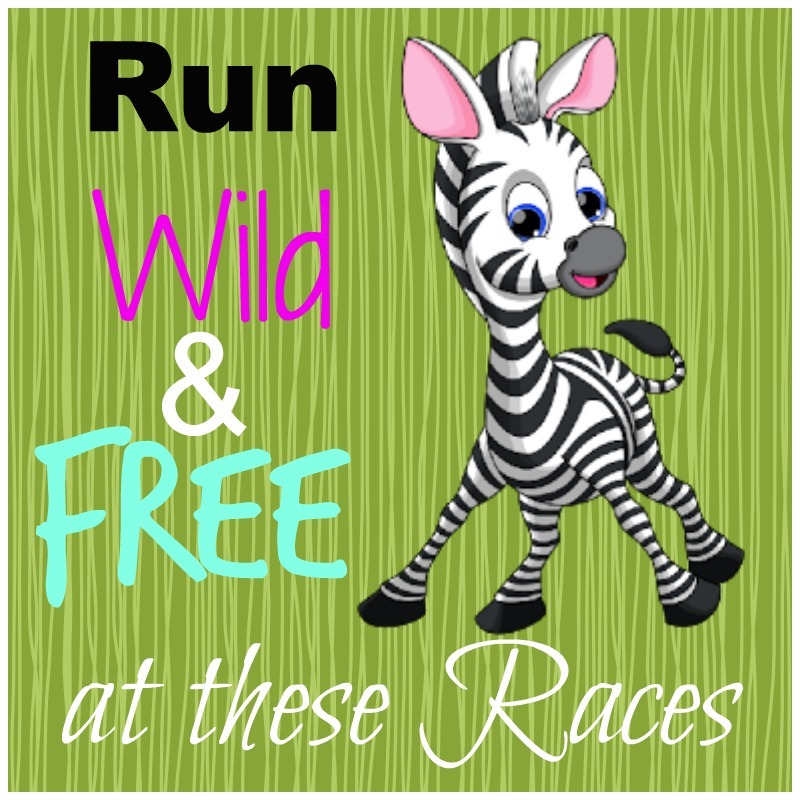 The weather was gorgeous outside and I just thought to myself “Yes, yes I do want to run wild and free”! In fact, I couldn’t wait to get out and run on my trail and soak in the gorgeous weather. 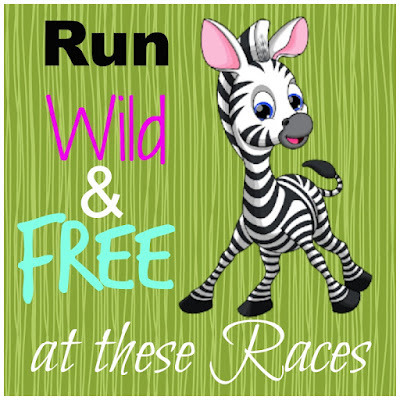 I admit I daydreamed for a moment about really running wild and free and what it must be like to run on the African plains while seeing giraffes, zebras, and elephants in the distance. Wow, that would be amazing. But truth be told, I don’t ever desire to visit Africa anytime in the near future, so where else could run Wild and Free? Oh, how about Animal Kingdom at Disney? I’ve done a few races here already and I don’t remember even seeing any animals along the course. So then I remembered that there were some Zoo Runs in the United States. I would like to run one of these races one day but as of right now, there aren’t any near me but I thought I would share some popular ones in hopes that you might be able to run one and then report back to me. These races are a combination of 5K and 10K races. Many of them offer kid races as well. This week went really fast, as I suspect the rest of the weeks will go from now till the end of the school year. After being a little bummed last week because I wasn't able to reach my step goal as often as I liked, I went into this week very strong but then I fizzled out. Here are some highlights! 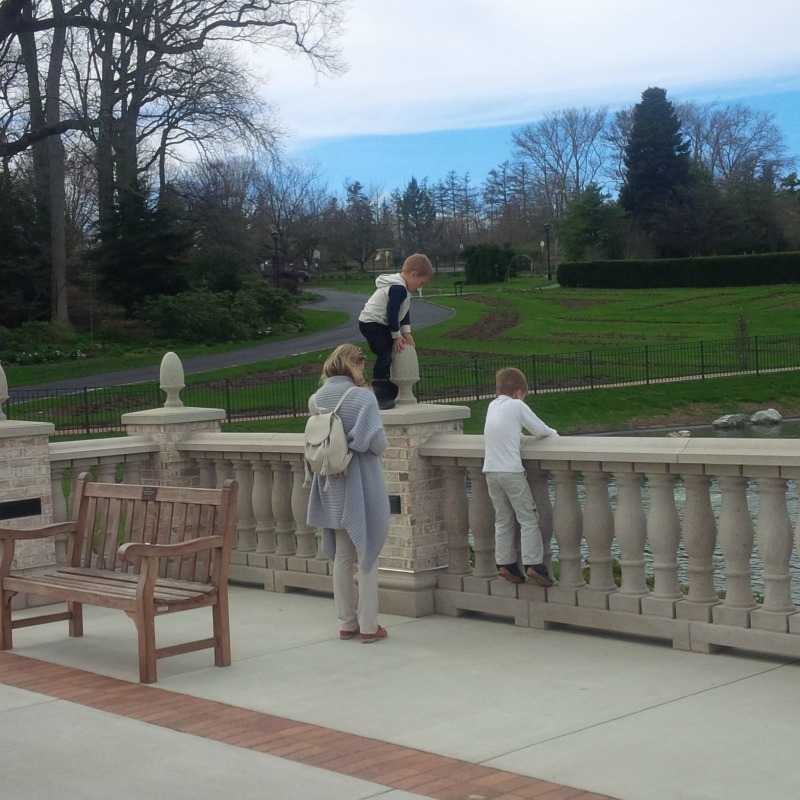 Monday We had our photo shoot down at the park and then we did a loop around the island. I then came home and discovered a new 2 mile running route near my home! 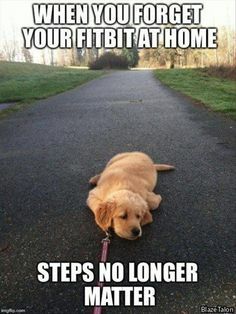 I had no problem getting my steps in this day. A fallen tree blocking the path. Tuesday I went back to the island by myself and was sad to see all the destruction from the storm earlier this month. Got my goal steps in this day too. Wednesday is where it started to go down hill. I did not run or walk but I did start to shave Baylee girl in preparation for her first swim. Then Scott and I took a friend out to dinner (it was a buffet) so I felt miserable afterwards. 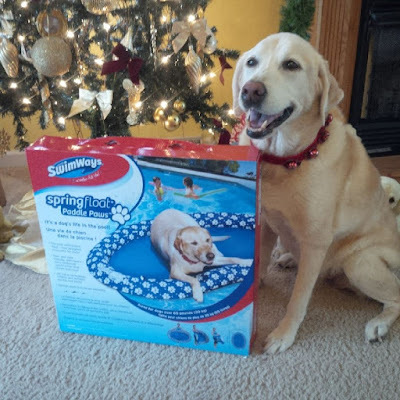 Thursday was Baylee's first swim of the season (sorry no photo) but I was taking video of her using her new raft! At this point though she was just excited to get swimming, she didn't want to be laying on a raft. By mid summer she'll be lounging and I won't be able to get her off! I did hit my step goal this day. Friday I got Runner mail from Wendy. Runner friends really are the best. They just get you! Thanks again Wendy! Saturday was such a waste of day for me. Scott was away this weekend so Baylee and I slept in pretty late. Most of the day was spent playing with my new phone and talking to a friend for a very long time! It wasn't till after 6:00 pm that Baylee and I decided to hit the fitness trail before heading to Wendy's for a Cranberry/Apple Chicken Salad and an organic Green Tea. Now speaking of phones, I decided that now was a good time for me to get a new phone. I know my friends were probably sick of me asking them questions about their phones...lol. As you may know, I am a huge fan of Blackberry. I'm on my 4th one! I HATE to get rid of it. It is the perfect size (fits right in my running pouch and my pockets), has a great camera, has an SD card (which many don't have), it's just SO easy to use AND I can blog on it (no app required). The downfall is that some of the keys are starting to stick and one of my favorite apps (IG) does not work properly. Is this worth upgrading? I don't know, but I did. I ended up getting the iphone because of its small size. I did do a lot of research so I didn't go into this blindly, but you never know what something is really going to be like until you start using it for YOUR needs. Now, I know that everything takes time to get use to but here are some things that I'm disappointed in so far. - I don't like all the clicking and screens that stay open. I like swiping up and swiping down to open and close screens. -I can not blog from my phone anymore. This is HUGE and may be a deal breaker for me. Blogger no longer offers the Blogger app for iphone and I can't even blog from the Blogger home page (with no app) because it does not allow me to insert photos from my phone. There is an option to do so, but it does not work on iphone. I guess people use the "cloud" and Google pics but I'm not comfortable having all the pictures I take go directly to who knows where. So now I spent all weekend doing more research on phones. My ideal phone would be less than 5.5 inches, be Android based, have an SD card and decent camera and now here's the downside, it has to be able to work on the Verizon network. I've found a few that fit this description but they are not available for Verizon or they are not available in the USA. There is a new Galaxy that came out this spring that fits the bill as well as a NEW BLACKBERRY but right now neither are available in the USA, bummer! I though the iphone would be a step up from my Blackberry but as it turns out, I think Blackberry was ahead of its time (Yes, I'll keep telling myself that). As of right now, I'm using both phones. Even though I had plans to run a few 5k's and 10k's this Spring/Summer, I 'm actually only signed up for one race so far and that is the Monumental Mile in June. The Monumental Mile is a Race honoring the veterans in our community and it will take place right before the 4th of July's Veterans Parade. For the last several years I drove my grandfather in the parade. I plan to do that again this year after the race. On Monday, my running buddy Jason ( who you may remember from The 4th of July 5K, The Love Run, the Harvest Festival race, Running of the Elves, VA Beach Half, and other runs) and I got interviewed by the local media and then had a photo shoot to help promote this inaugural race. I knew that we would be doing the photos, but I didn't know if they would be in color or black and white. I should have planned my wardrobe a few days in advance, but I didn't. Since this was promoting a military based race, I thought I would wear my favorite Army t-shirt. Of course I should have laid my outfit out the night before because it was a half hour before the shoot and I could not find the shirt. O well. I decided to wear my colorful Fabletics capris just in case it was in color. I threw on a tank and called it done. We met the reporter at the park and since both our grandfathers served in the military we talked about the significance of that. 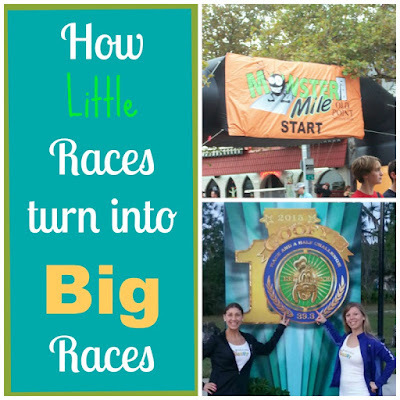 We then talked about the difference between training for races of various distances. After that, it was time to shoot some pictures. I didn't realize that we would be doing some action shots. As you may notice from the blog, I don't do running shots. I don't know how the rest of you do it. Is it a GoPro thing? 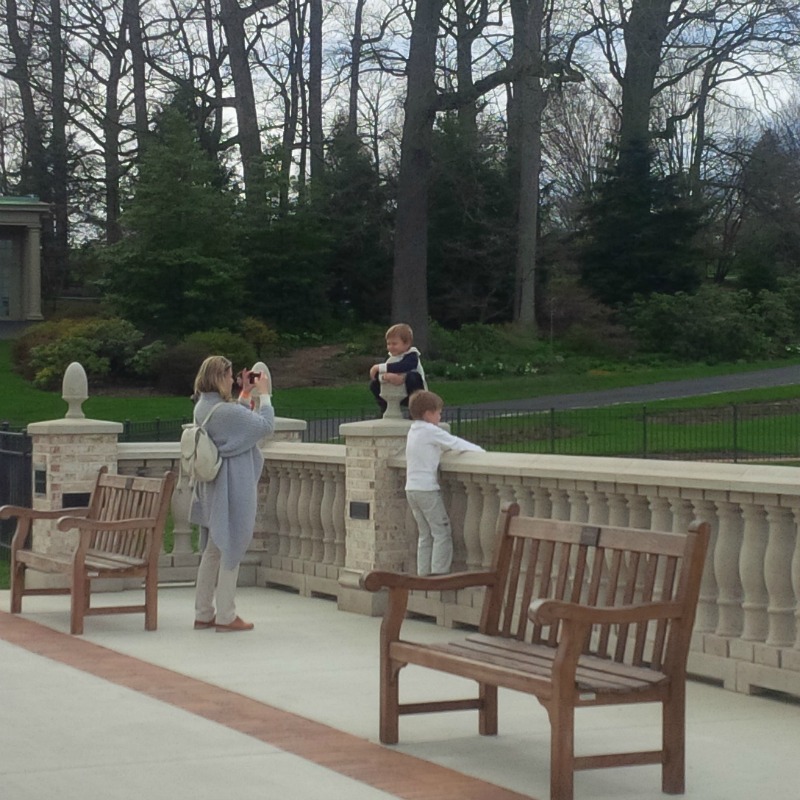 The photographer picked out the perfect spot and we did several running passes so he could get some action shots. Jason and I both agreed that it was kind of fun! We then did a few other "still" poses and one with a "high five". Here is a photo from the online version of the newspaper. You can't tell because of the text banner running across the screen, but we are running. 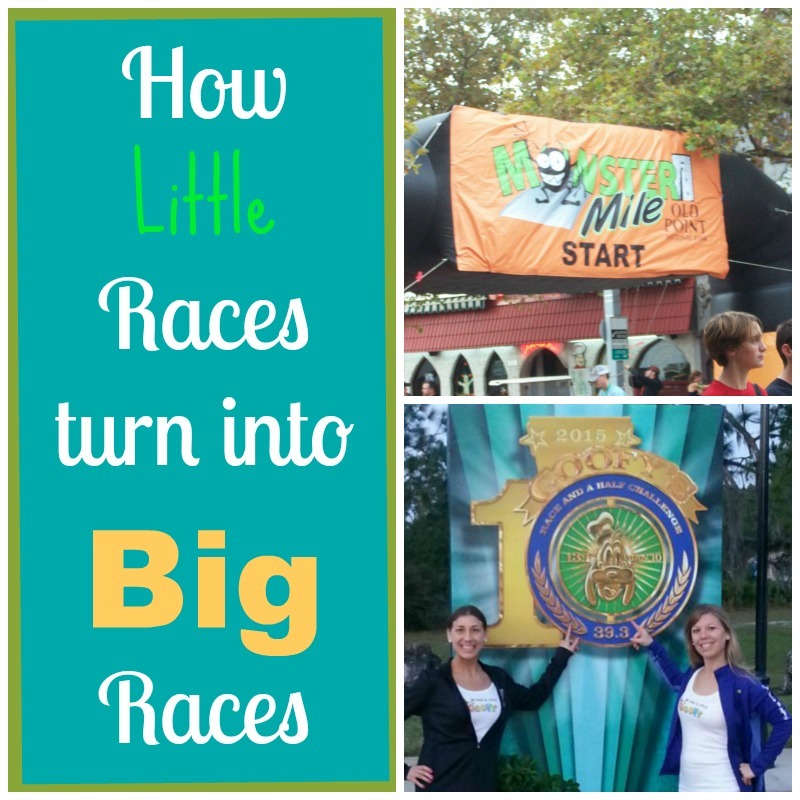 I had a friend tell me one day that her very first race ever was a half marathon. I asked her why she didn't start out with a shorter distance race like a 5K and work her way up. She told me because 5K's were always on Saturdays and she had to work on Saturdays. The only days she had off were on Sundays and that was always when the "Big" races were. Back then I thought it was odd that she jumped right into a half marathon without ever having run as much as a 5k race. 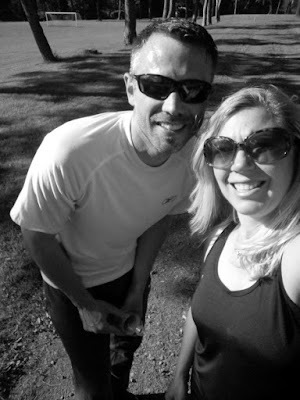 However, as years went by and I've met more runners (and started this blog), I've realized that's the way a lot of people started out. I on the other hand was much more cautious with my running journey. As you may recall, I had been running the Disney 5K races for several years (way before I started blogging). I ran these to be with my family and to just have fun. It was all the "racing" I ever desired to do because I didn't think I would be able to do anything further. As you may also recall, Disney only gave out the rubber medallions for the 5K races back then. The year my sister ran the Princess half marathon and earned the Princess medal ( a REAL medal), was the year I decided I wanted to earn a REAL Disney medal as well. 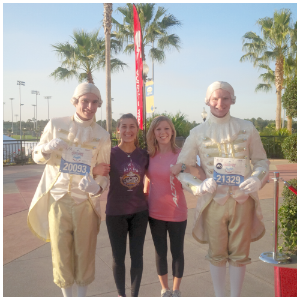 I could never run a half marathon, so the Princess race was totally out for me. 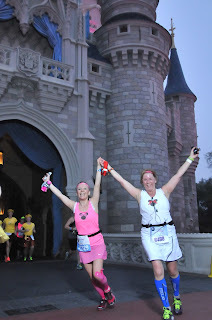 I had a friend that did the Tower of Terror 13K as a relay race. 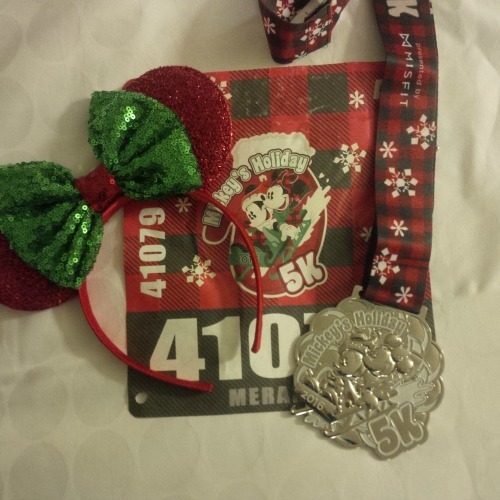 Even though at the time I didn't know exactly how far a 6.5 K was, I knew it wasn't that far and thought I could run that far for a "real" Disney medal! So that was my plan. Except, now that race no longer existed. 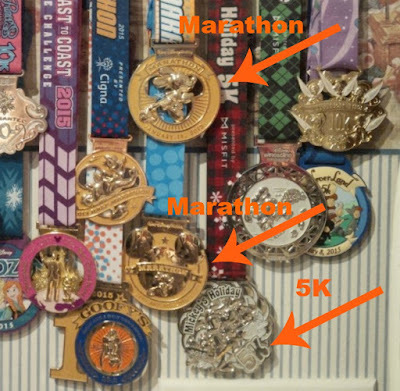 Back then the Disney 10K races did not exist, so my only hope of earning that "real" Disney medal was to run the Princess Half Marathon, so I started training! My first REAL race that I ran for time (and received a REAL medal for), was the Monster Mile. The race was literally only one mile and the field was a mix of adults and kids, and adults running with their kids. As we began I remember getting passed by all these little runners. This was so long ago so I don't remember all the details but I think I may have walked a few seconds at the half way point. I ended up finishing in 10 minutes flat. I was neither excited nor disappointed because I had no idea what an average time for a one mile race was. I then went on to race a 5K where I was pretty proud of my effort seeing it was my first time "racing" a 5K and it was a pretty hilly course. Don't think I went right to a 10K then. Oh no! I raced a 7K and then a few months later I ran an 8K before running my first 10K (which was a trail race and not a good course for my first one). I ended up PR-ing at my second 10K by 12 minutes! After the 10K, I still couldn't commit to a half marathon, so I ran a half marathon relay (and loved it)! In typical Meranda fashion you would think that I would have done a 10 miler race before running the half marathon, but according to my records, I didn't. I guess after having proved to myself I could run the half of the half, I was ready for the real thing! Please note: I did do longer training runs for my half marathon, the races listed are just the distances I raced during that time. It's always hard to come up with a perfect gift for mom (or anyone for that matter). Since most people already have the things they need, I've often found it better to focus on an experience other than an item. I've taken quite a few trips with my mom, some of them were quick trips and some were longer vacations. I could go on and on with all the things that we do but I thought maybe these trips would appeal to those looking for some girls only trips. 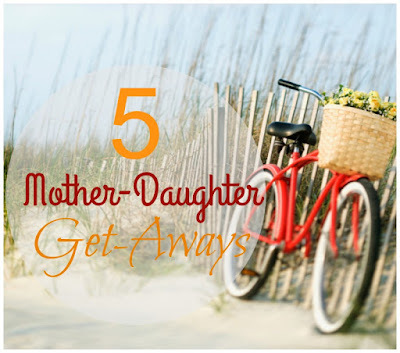 Although it may be too late to plan something like this for mother's day this year, you could keep it for an idea for next year or for when you want a trip with mom, a sister or a girl friend any other time. Here are 5 great Mother-Daughter Getaways. 1. This is probably a no -brainer but how about a weekend at a Spa? 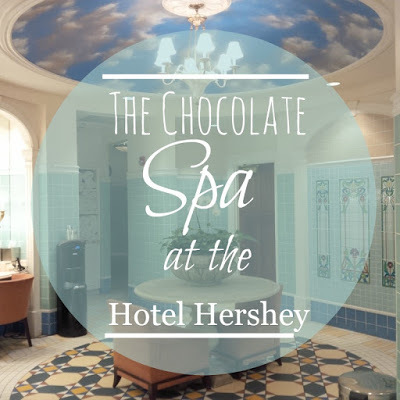 As you know, we went to the Hershey spa last month and it was a great mother - daughter experience. Do you have a great spa near you? 2. Is your mom a history buff? 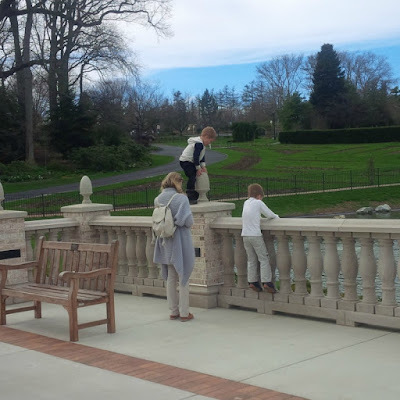 If so, she may enjoy touring the Newport Mansions. These Mansions sit along the coastline of Rhode Island and they are chalk full of history from the days of the Kennedys, Rockafellers, and Carnegies. The Mansions are fully furnished as they were in years pasts and hold lots of interesting stories from that time period. Today many of them are used for weddings and other high profile events. Some have been the backdrop for some famous movies. 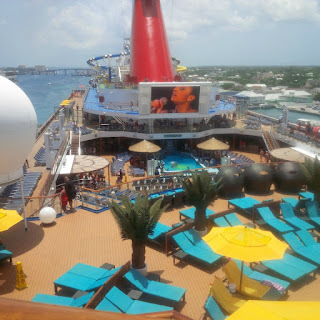 We did this trip as a double mother daughter trip as we went with our mom and our nana. 3. My mom and I like to do cruises with just the two of us. 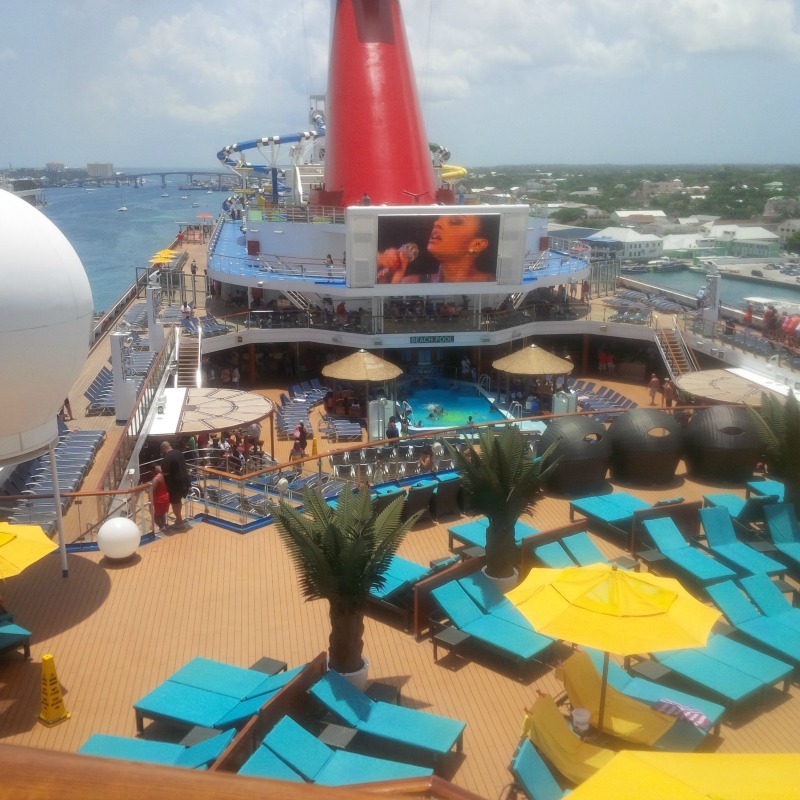 This is a great option for us as it does not require a lot of planning and because we are with in driving distance to many ports (advantage of living on the East Coast), we can cut out flying (which you know I hate to do). This allows us to keep expenses down and we can pack as much as we want! 4. 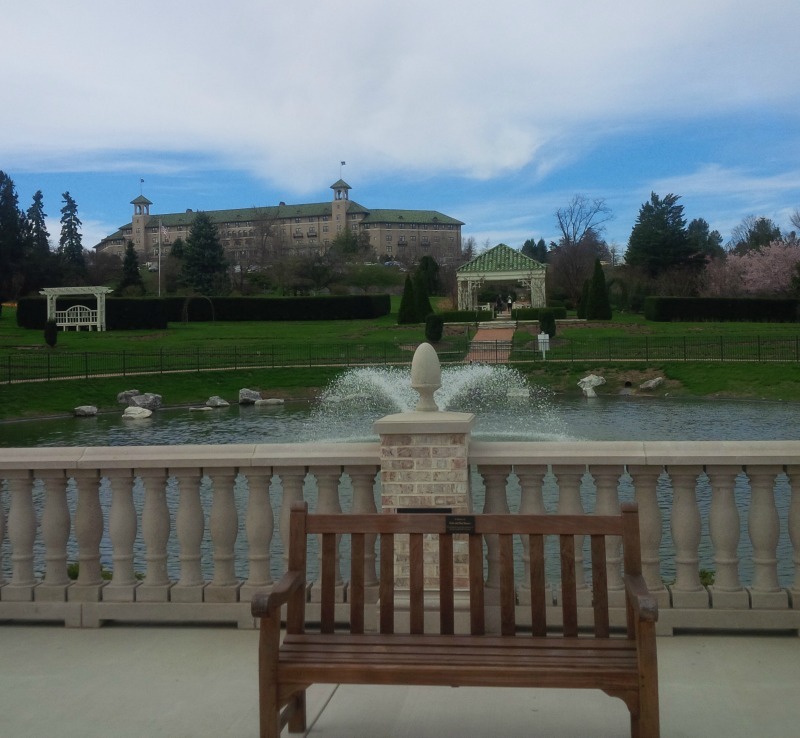 Make a weekend out of a Dinner Theater or a Murder Mystery Weekend. I use to go to a Murder Mystery weekend every year that was an all inclusive resort. The room, the meals, the entertainment, activities, and snacks, for the entire weekend were included. These can be so much fun! 5. You didn't think I'd leave Disney off this list did you? Whether your mom is a runner or not, The Princess Half marathon weekend is the perfect girls only get away. If Disney is not your thing, perhaps participating in another girl themed race like the Diva Run! The very first race medal I ever received was from the Royal Family 5K at Disney World. I guess back then it was actually called a “Medallion” because it wasn’t made of metal. It was plastic but it was colorful and it was cute so I didn’t mind. Even though I was so excited to have done my very first 5K, I didn’t really display my medal/ medallion. I think I hung it in my closet. In my mind, I wasn’t going to display it until I had a collection. And to me, a collection meant having three. I don’t think I ever did end up making my display of my three Disney Medallions because I ended up graduating from only running 5Ks before I had earned all three. With that being said, when I ran Mickey’s Holiday 5K this past November, I was presented with a HUGE metal Medal! This was the first run Disney race at WDW that gave the new and improved medals for the 5k instead of the plastic ones. I knew ahead of time that they would not be plastic and I was super excited. Well, I recently hung the 5K medal along with my Wine n Dine half Marathon medal and my NYC half marathon medal ( I know I’ve procrastinated on this task), and I still can’t get over how HUGE this 5K medal is. I mean it’s a really nice medal for the price you pay to run a Disney 5K, but the more I looked at it the more irritated I became. This medal is larger than most of my longer distance races and I didn’t put that much effort into running it. I don’t feel like I’ve really “earned” a medal of this magnitude. For a 5k, does anyone really? For those people whom this was the first 5K, I understand that completing a 5K is a HUGE deal and the medal is fitting. I’m not taking that away from anyone. But come on, it’s pretty much the same size as my marathon medal that took blood, sweat, and tears to earn! I’m just sayin. Another thing I finally did was print out my certificate for my NYC Half. I was so excited when they became available because I’ve made it a habit to print certificates for any races that I run that are a half marathon or longer (and including my TOT 10 Miler). I also went back through and printed a few from my Disney races in 2015. Thank goodness I already had them downloaded on my computer because I do not think they are available to print anymore and I think this is because Disney no longer uses Marathon foto and I’ll tell you why. The Wine n Dine Half Marathon was the first marathon I’ve run since Disney photo pass took over doing the official race photos (instead of using Marathon Foto like they have done in the past). 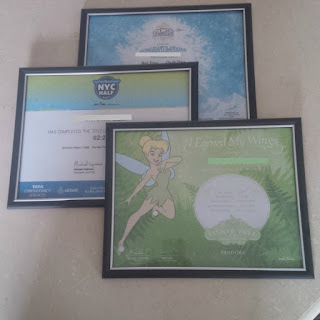 Also that race is the first race where the Disney race certificates are MUCH different, and they are now more difficult to download and print. I just can’t seem to print it out like a normal certificate. It’s mis-shapen and all wonky. Also, Disney also has the 5K certificate available to print (if you are able) which was also something they have not don’t in the past when using Marathon foto. Has anyone else tried to print their certificate? I should feel lucky to have earned such a huge medal for a 5K and the certificate thing is only a small annoyance but I would like to keep up my tradition of printing my certificates so that does kind of annoy me. This past weekend was the first weekend of the start of the tourist season at the restaurant which means crazy long hours while the bands play every weekend. Both Saturday and Sunday I worked 10 plus hours on my feet, having no break and no time to eat. Needless to say I was exhausted. That night I caught up on my sleep after a long weekend and slept for 11 hours. The following day I had already committed to go to Adventure Park. 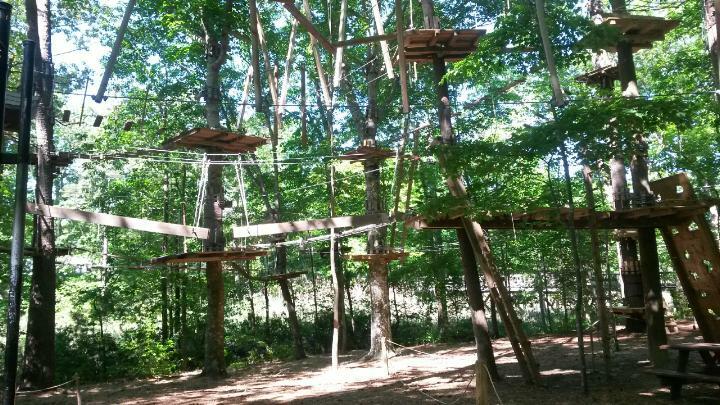 It was fun doing the zip lines and obstacle courses. There were plenty of different courses to choose from beginner all the way to advanced levels. It is a good thing I am physically fit because some of the obstacles were very challenging and involved great upper body strength. After another busy day, again there was no run! 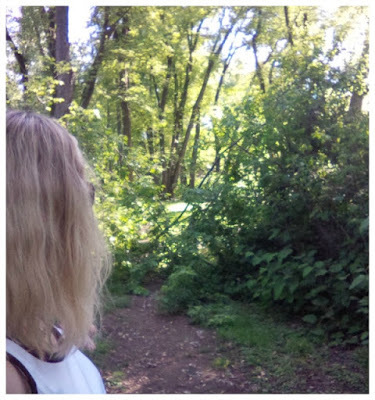 I could not tell you the last time I went three days without running nor working out (well technically I guess you could say the Adventure Park was working out, but I mean in a gym setting). I was planning on getting up early the next day to take a class at the gym before having to attend a mandatory meeting but when I woke up it was stormy and raining out. No way was I going to the gym. Sleep sounded much more appealing. After my meeting I did not have any other commitments so I decided to go for a run. I wasn’t sure how far I was going to go but I knew I had some catching up to do since I took three days off (not sure why I think that since I am not training for anything). Anyway, I put my backpack on and put a bag of sour patch kids and pretzels together and I was out the door. The run was very uneventful. Besides dodging some puddles in the park from the rain earlier that morning not too much happened. I was just trotting along listening to my new podcasts and every couple miles ate some of my sour patch kids. 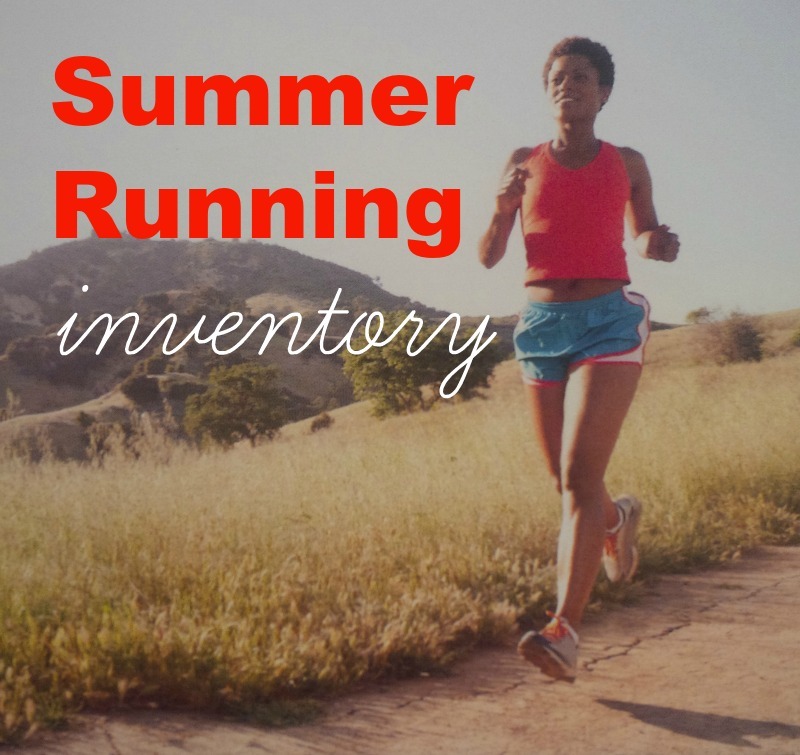 I guess it is a good thing that runs can be uneventful. I’d rather have an uneventful run than a run that was awful and I was struggling the whole time. After running in the muddy park the first half of my run, I decided to take it out on the road to backtrack home. Even though that way was a bit longer, it makes for different scenery which I think passes the time some. 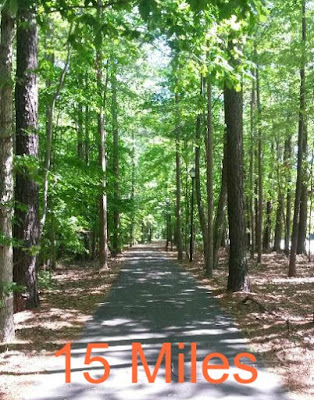 When I arrived home I ended my run at 15 miles. I’d like to think I made up for those miles I missed this past weekend. I took a hot Jacuzzi bath and had a salad for dinner. I know so boring, right? I could have definitely splurged after that long run, but then I would have felt like I was sabotaging my run if I did that. I did have a glass of wine that evening though because it’s all about balance, right? How long have you ever gone without running/working out? Did you lose your motivation? In every race there is a start line and a finish line. The same thing happens at every race (you start, you finish) regardless of what the race is called so why are we so drawn to races that have fancy names or themes? There’s the Color run, the Pirate run, the Leprechaun run, the Super Hero run, etc. You get the idea. 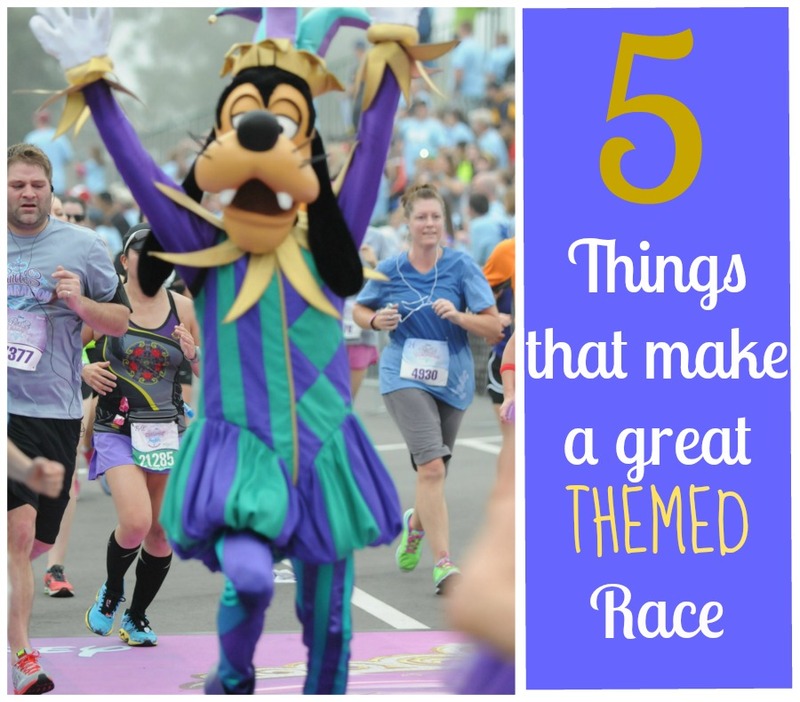 So many races claim to be a “theme” but what does that really mean anyway? What justifies a “theme” race? 1 1. Themed photo ops- If it’s a super hero run, there better be an opportunity to get your photo with a super hero or at least a colorful backdrop that says as much. For a Leprechaun run or any other Holiday themed race, I would expect some sort of seasonal background. 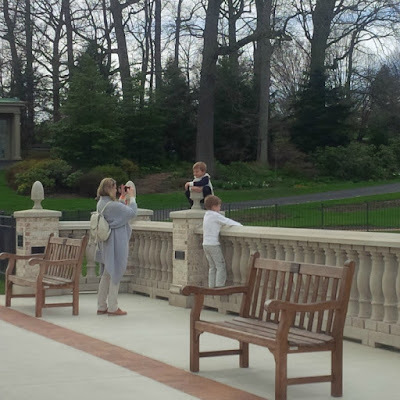 In my experience only larger races have had photo ops, but it wouldn’t be all that hard for all races to do even if we had to use our own cameras (which let’s face it, most of us take our own pics anyway). 2 2. Costumed Runners- I love a race where runner’s are encouraged to dress up. I may not always participate but seeing runners in their best Santa garb, Halloween outfit or just Rockin it out at a Rock n Roll series race is always fun! 3 3. 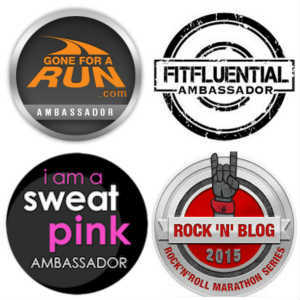 Themed Swag – I love when the medals correspond with the theme of the event and are not just a generic race medal. Most races are pretty good about this one. Same with the race shirts. 4 4. On Course Entertainment- Whether it’s Characters on course, bands, cheerleaders, or just inspirational signs along the course, I think this contributes to the overall ambiance and theme of the race. 5 5. What else is there to do?- I think this is a huge factor when theming a race. Is there a post race bash afterwards? Is the race associated with a festival or a parade? Is there access to a theme park, a concert, or a chocolate factory perhaps? Here are my thoughts on a few “theme” races I’ve done in the past. Of course Disney hands down has the theme race covered with ALL 5 of these points! I did a 4th of July race last year and if HEAT was the theme, they had that covered. Other than that, runner’s wearing red, white, and blue, and some watermelon at the end was the extent of the theme there. When I did the movie madness race, some runners dressed in costume and the AG awards were replicas of Emmy Awards. When I ran Wicked (Halloween theme race) almost everyone dressed in costume, the medals were spooky Halloween looking medals, and the hot soup in a bread bowl hit the spot on a cool fall day. When I ran Running of the Elves many runner’s where in Christmas attire, the race director was dressed up, there were Christmas gifts along the course to pick up, and the AG awards were very cute Christmas ornaments. Hershey- I guess the theme here is obviously chocolate. The medal and shirt reflected that, there were chocolate candy characters on the course, you got chocolate treats at the end, and of course there is Chocolate World (and the Park and the Chocolate Spa both at an additional price) to visit after the race. Overall I think it was themed nicely. This weekend our neighbors had some visitors and one of them was driving this little car that was a mint color. 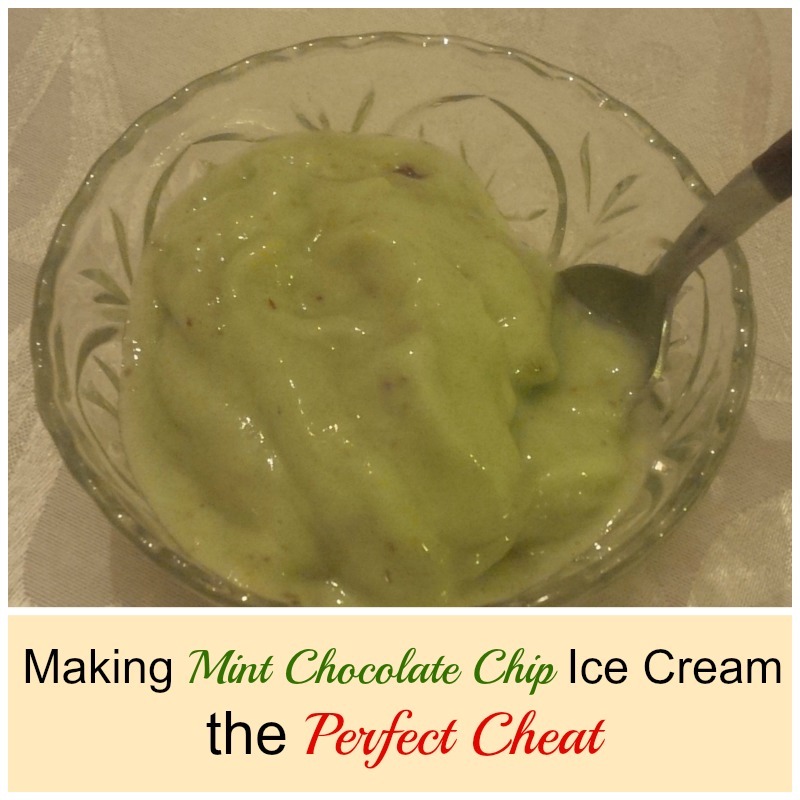 I said that it reminded me of Mint Chocolate Chip ice cream and ever since then I've been craving Mint Chocolate Chip ice cream. I was going to go out for a cone for the past few evenings but I've been trying so hard to get my 10,000 steps in and figured having an ice cream cone would be counter productive. Slice up a banana and freeze it for at least an hour. Once frozen, throw banana slices and flavoring into food processor. This is what I threw into the food processor with my banana slices. Do not blend too long because you do not want it to be mushy. I could have used a little more chocolate and if I had chocolate sauce on hand I would have put some of that in too ( I know, that would have been counter productive as well). Good thing I didn't have any chocolate sauce. 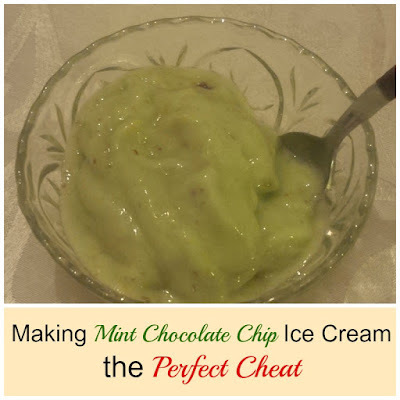 I only ate a small dish but it definitely curbed my craving for mint chocolate chip ice cream and I didn't feel guilty about eating it since I made the "cheaters version". 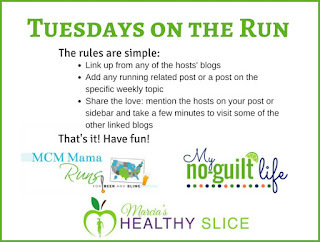 We are linking up with the gals from TOTR where the topic is "Cheating".